Trexlab is dedicated to grow and develop the potential of Orimetic as a flexible multifunctional material technology, a new computational material design derived from repeated patterns. Where traditional origami is known from paper folding, Trexlab has developed a patented technology molding the tactile folded pattern into polymers. The method allows for utilization of origami's intelligent folding pattern in a super elastic and durable material quality. Orimetric's meta material valley and mountain design allows for excellent impact absorption, flexes in 360 degrees with structural qualities and has excellent sound absorbing qualities. Further more Orimetric will fold into a small package and expand up to ten times in four directions. 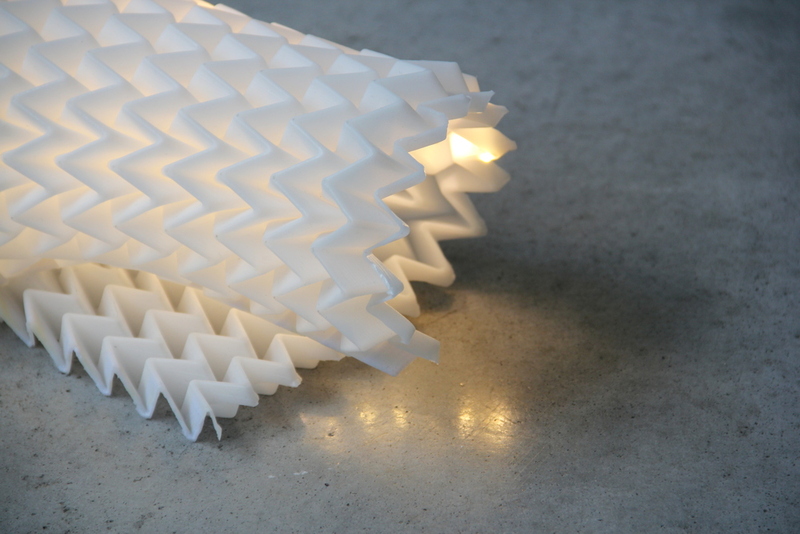 A research study in molding electronics and lights into the flexible orimetric structure. A utility design study research study utilizing orimetric as a container construction.